Food 52 has changed the way I think about cooking with their not recipes. To be honest, unless I know I’m writing something to post on Hangry Woman, I actually don’t use a recipe for most dishes I’m making at home. I cook for myself and Bryan, I know what we like, and most times I’m really familiar with what goes into a dish I want to cook – so, I just make it. That’s how I learned how to cook a really great steak. I was afraid to make steak for the longest time. As an almost life-long Texan, I’ve never owned, or operated a grill, and the thought of making myself ill was also a deterrent from not trying it out. I finally decided not to be afraid, and I convinced myself to do it. My first try wasn’t the best, but as I’ve tried it more, I get better with each time. I’ve experimented a few times, and every time, I get a nice, crust on the outside, and a nice rare to medium rare middle. First thing is first – I set out a steak until it becomes room temperature this helps to make sure your steak cooks evenly. I typically pick a ribeye because I love the marbling. It’s got fat in all of the right places and keeps the steak really flavorful without a ton of work. I rub it down with kosher salt on both sides, and crack fresh pepper over the top. While that’s happening, I heat my griddle. I cook my steaks on very hot cast iron griddle. I turn the temperature up to medium high, and melt some butter on the middle of the griddle. 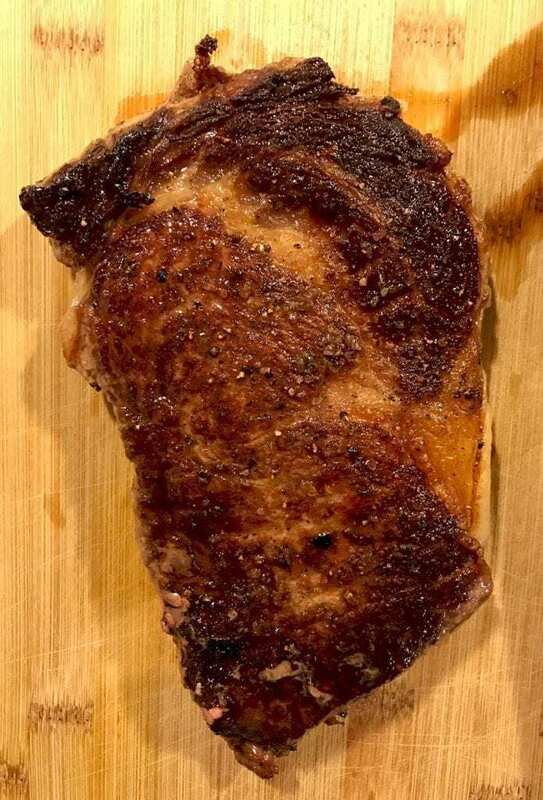 Once the griddle is heated and the steak is at room temperature (30 minutes, or so), I throw my steak on and let it cook for three minutes per side. It’s important not to move it, nudge it, or lift it while it’s cooking – you want to get that nice crisp outside, and cook evenly on both sides. After it’s cooked, I usually poke it for temperature. I like my steaks more on the rare side, so I feel for a little bit of give when I touch it. Then, I move it on to a cutting board and let it rest for five minutes so its juices redistribute, and we get a super tender steak. Then, of course, I eat it, slowly, and I totally enjoy every bite. What’s your favorite way to cook a steak? What’s a good tip for someone’s first time making one? Looks fantastic! 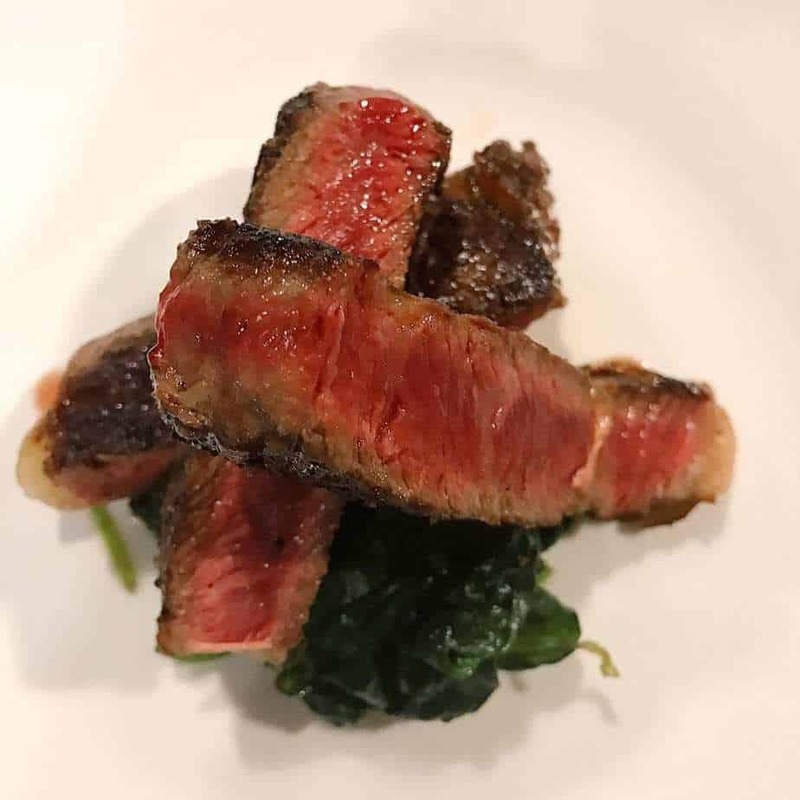 I love rare steak, especially as we get local, fresh meat that is incredibly tender. Cooking on cast iron totally changed the game for us too! I know, Chelsea! Something as simple as just changing your tools makes a big difference. Hot, cast iron just gets an insane sear! The key to a great steak is starting with an excellent cut of prime beef. No amount of prep will make a bad cut taste good. I like the reverse sear method. Season with salt and pepper. Cook in oven at 275 until desired doneness (about 30 min) then sear 2 minutes on each side on a hot skillet. That’s absolutely true, Jamie. You can’t save a bad cut. I’ve always wanted to try the reverse sear method. You posted an amazing photo of one you made earlier – it looked AMAZING. Though I can count on my hand the number of times I have had steak my 33 years on this earth, I will cherish this recipe. Stepping my steak game up will please my hubby for sure. Great post! Thank you! It’s just so simple, no frills. When you’ve got a good cut, it’s just perfect. I love grilled steaks seasoned with just salt and pepper. Grass-fed only. For the sauce, a simple butter, lemon and Rosemary sauce for dipping. Letting the steak rest after grilling is the key, it allows all that juicy goodness to stay in tact! Great tips, Mila! Thank you! I love the sound of your sauce – it sounds really heavenly, and the perfect companion with an nice, juicy steak! Im defrosting steak as we speak! i have a real tendency to overcook. That happened to me A LOT on my first tries. It’s like cooking any dish – your practice will totally pay off :). I still use a timer to make it work :).